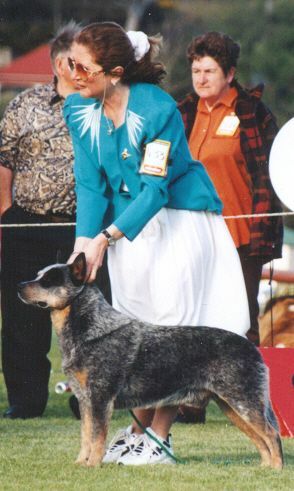 The youngest Grand Champion in the breed and one of the all time top winning Australian Cattle Dogs, Ampol was taken from us on October 3 2002 after a long battle with kidney disease. His Royal challenge wins were BOB Sydney Royal 1996 and 1998,Dog CC & R/U BOB 2001. Hobart, 1998,1999,2000,2001 and R/U BIG. Launceston Royal 1998,1999,2000,2001 and R/U BIG. Brisbane Royal 1999. Multiple BIS Specialties in 3 States and 10 BIS All Breeds. Professor Brian Corbett writes after awarding Ampol BIS at the ACD Society of NSW Ch Show 2000. "This dog is an excellent dog of great type. He displays the characteristics of the breed that all should search for. He is balanced, properly coated and of excellent colour. he is moderately angulated and the front and rear balanced with a great level topline. His head shape, eye placement, colour and 'glint' were all excellent. Feet were great".